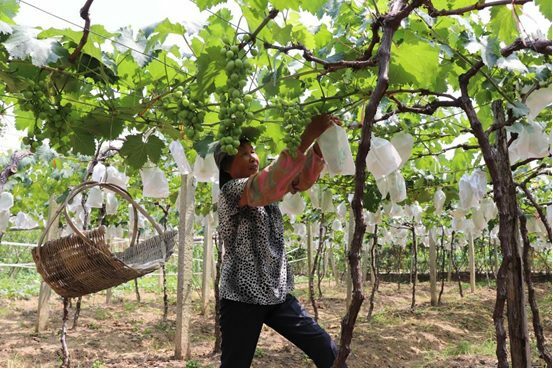 Thanks to the regular training and guidance offered by sci-tech “commissioners”, the 51-year-old woman Wu Xiufeng from Zhangdun Village in Nanping of southeast China’s Fujian Province has now grown into an expert of viticulture from a farmer that knew nothing about grape planting more than a decade ago. The sci-tech commissioner system was firstly implemented in Nanping in February 1999. The city sent 225 sci-tech personnel to 215 administrative villages, bringing technology to the countryside and laying solid foundation of human resource for targeted poverty alleviation. “The commissioners taught me everything step by step from seedlings selection and growing to cultivation,” Wu recalled. Under the technical guidance, she has built her own vineyard. Apart from planting techniques, Wu has also been taught marketing. Now she earns nearly 100,000 yuan ($16,000) each year from her prospering grape business. Her family has moved into a spacious and bright house because of this. Wu is not the only farmer in Nanping that has shaken off poverty by learning technologies, and Cikou Village in Chuanshi Township that traditionally relies on bamboo growing is a great example. Low bamboo production, late shooting season and low industrial profits had long been bothering the villagers. It was the sci-tech commissioners sent there who promoted scientific management of the crops that have helped advance shooting season, increase bamboo yields, and benefit more than 30 impoverished villagers. Now Cikou is home to 1,086 mu, or 72.4 hectares of bamboo, with each mu of bamboo making a pure profit of 15,000 yuan. The crops have made economic value totaling 16 million yuan. The Nanping sci-tech commissioner system has been promoted to national level as a reference for the rest of the country after the city held a national sci-tech commissioner meeting in 2017. So far, Nanping has sent 10 batches of 9,483 sci-tech commissioners to all villages under its administration. In 2017 alone, 1,282 people were sent to the countryside. In addition, the city has established partnerships with 60 institutions and organizations such as Chinese Academy of Engineering, Chinese Academy of Sciences and Tsinghua University. Currently, the sci-tech commissioner system is expanding its coverage from issues related to agriculture, rural areas and rural people to sectors of high-tech and rural tourism. Yuan Yi, Secretary of Nanping Municipal Party Committee introduced that Nanping is a city where nearly 80 percent of the land is covered by forest. According to him, planning experts and ecologiests will be prioritized in the next round of selection of sci-tech commissioners.